Every dog that comes into our hospital is treated like family. We provide individualized care for each pet. By providing this type of quality care, pets can return home healthy and happy. Our boarders have the opportunity to fully relax in our newly renovated, state of the art boarding facility; complete with a fenced and secured play area, that includes astroturf, a fully shaded canvas sun canopy and even a bone shaped pool! Our facility offers Outdoor Playtime multiple times throughout the day. Outdoors, dogs are provided time to play ball, enjoy the swimming pool or relax in the shade. 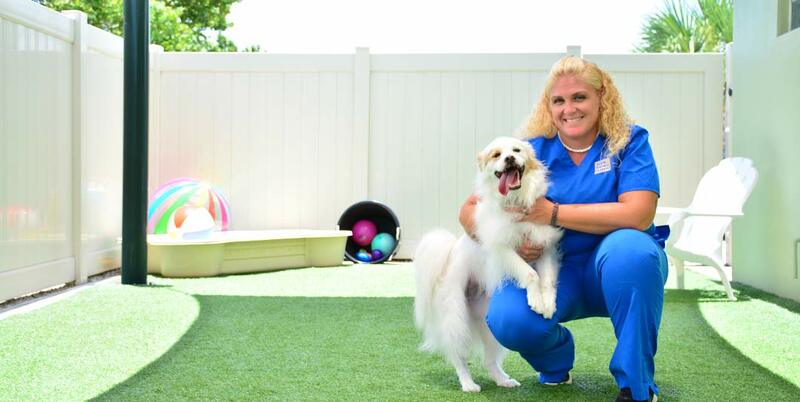 While playing or relaxing, your pet will be supervised by our attentive and loving staff.